Bernkastel is an extremely powerful witch who has lived a thousand years. It is said that she lives in a world where concepts like fate and possibility can be visualized. She can give birth to all kinds of miracles with her immense power but, in compensation for that, her heart ends up breaking a bit each time she uses them. Age: 1000+, but is beyond the concept of time. Stamina: Inexhaustible. Depends on the will and determination of her types of thoughts. Fought with Lambdadelta, Battler and Ange one after another and showed no signs of tiredness. Intelligence: Genius by human standards. Insightful, clever and cunning, a good psychologist and actor, has a great experience, could be an excellent detective or criminal. "If a riddle is solvable she can solve it without fail regardless of difficulty." Is an avid reader of the mystery genre to the point where she's knowledgeable of countless tricks and riddles even Battler hasn't heard. Weaknesses: Her magic depends on her faith in it; Boredom and the possibility of losing her will; Alcoholism. She has Immeasurable pride and is truly traumatized (hates to think of her human past), as well as being unbalanced and imperfectly in control of her emotions. She may be shocked if someone hurts her (the concept of which she has long forgotten). She cannot read probabilities before the result. 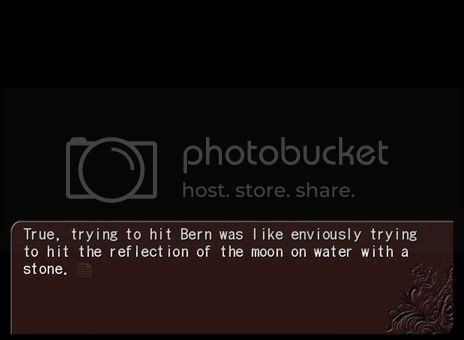 - Magic of Miracles: Bernkastel's magic. Basically, she can locate any world and achieve any end she wishes as long as it is not completely impossible. 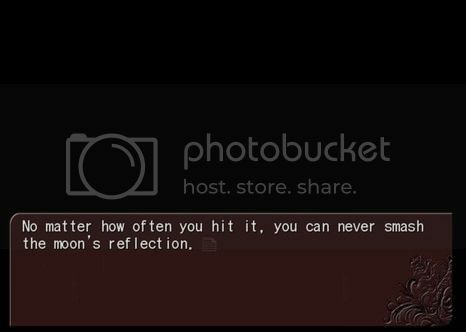 In theory, she is the witch with the strongest power, but that is actually not realistic, like folding a piece of paper a hundred times so that it'll reach the moon. And she folded it a hundred times. - Truths: Truths are moves used in debates between human and witches, while they're arguments they usually take the form of powerful conceptual weapons that damages the concept of her target. Because truth is a conceptual move, it cannot be avoided but can be confronted with other truths. Blue Truth: It's used as a theory that works as counter-argument to the opponent's statement. It usually takes the form of a stake that impales the opponent; the opponent cannot remove the stake without countering the Blue Truth's argument using the Red Truth. The Blue Truth must abide by the Red Truth. 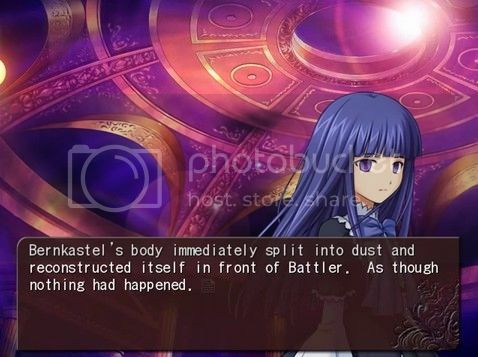 Although a single Blue Truth isn't lethal, enough will eventually deny the concept of Bernkastel's opponent, killing them. Red Truth: Anything said in red is an undeniable, absolute truth that cannot be denied, and does not need to be backed up by proof, although it is impossible to lie using the Red Truth. However, a Red Truth can be interpreted in many different ways.